Located an hour inland from the coastal resort of Bar Harbor, Washington County is a part of Maine few tourists ever see. In 2008 Washington County had the highest overall poverty rate and the highest child poverty rate among Maine’s counties. Many county residents rely on seasonal jobs to get by, but those jobs are harder and harder to come by. Automation has cut blueberry picking jobs from 6-8 weeks in the summer down to four. Red tide has closed many clam flats, eliminating clamming jobs, and a weakened fishing industry means lobstermen are hiring fewer workers to help out on their boats. During winter, many families are forced to make difficult choices between food and a warm house. 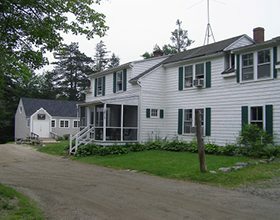 Family-to-Family’s partner in Washington County is the Weald Bethel office of the Maine Seacoast Mission, an outreach center and food pantry located in Cherryfield, Maine. In Washington County, Family-to-Family partners with The Good Shepard Food Bank to provide groceries for our sponsored families. Sources: 2005-2007 American Community Survey, U.S. Census Bureau, 2003 U.S. Census update, “Poverty in Maine, 2010” – Maine Community Action Association.